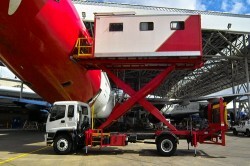 Southwell are renowned for their expertise in design, fabricating and servicing custom designed high-lift aircraft ground support equipment. 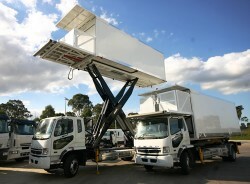 Their units fully comply with the Australian Standards and the International Airport Handling Manual (IATA AHM). All controls, hydraulic and electrical, are designed to comply with all Safety Standards and operate in a failsafe manner. Delivering engineering excellence, value, professional integrity, robust and dependable products. Southwell revel in developing solutions for large and complex challenges. 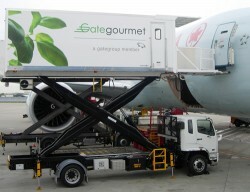 Recognised as a leader in the Airline Industry for innovative and reliable High Lift Service Vehicles, Hi Lift Refrigerated Catering Trucks, various High Lift Elevating Work Platforms, Service Platforms and many other types of Aircraft Ground Support Equipment. 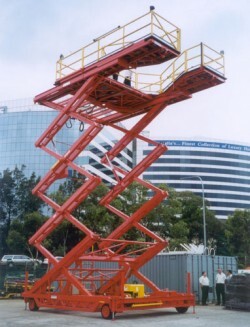 Southwell Lifts & Hoists will design and manufacture Elevating Work Platforms to your specifications, so you do not have to compromise on capacity, platform size, vertical travel or quality. Southwell’s unique design has produced the lightest most fuel efficient and environmentally friendly catering vehicle on the market. The hydraulic system operates at an extremely low 1500psi and low rpm under full load for long life and lower running costs. Weighing less than 12 tonne and offering 3-4.5 tonne lift capacity depending on the country of use, the unit is road registered and fully compliant with all relevant standards. The refrigeration unit can go as low as 4oC and can be run from both the truck engine or independent power supply. Robust and dependable design and quality manufacture ensures many years of trouble free service.